Here's the thing, ever since I returned to Singapore 2 years ago, I kinda lost my blogging mojo. I thought coming back to QQLand, I would be able to get back some of that momentum but somehow the workload does seem to allow me to do so. Come home liao, I ish a nuah slug with 1,001 distractions to do anything but blog. As a result, it is no surprise to see my visitor hits taking a beating and sliding down steadily. Well, not that I really cared anyway. Speaking of Blogger Association, I am suddenly reminded of something else. 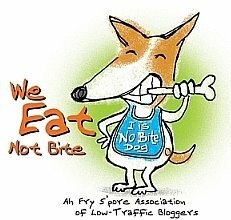 Show of hands who still remember the Association of Bloggers (Singapore)? Here's a few links to jog your memory. Enjoy. p.s. Eh. Why I not on Ah Fry's Poison List ah? iHurted. I ish also Low Traffic Booger! Barffie: Then add the badge and join us. Your $110 per annum subscription is waived! Eh, why got $110 subscription fee neber tell me one? last time i fix at $33 leh. Barffie, welcome ah! lemme know if u is in, i also tag u orh. Ah Fry: Alamak....... you exposed my markup!!! Ah Fry : Too late liao lah.... you pichar my lobang!! !